If you stick a pin in a map at the midway point between Los Angeles, San Francisco, and Las Vegas, you'll be pretty close to the spot that consistently records the highest temperatures in the western hemisphere - also known as Death Valley National Park. The unambiguous name comes from the party of stranded 49ers whose non-4WD covered wagons and faltering water supply stranded them in the valley in 1849. When the survivors were eventually rescued, someone tossed the historic comment over his shoulder on the way over the mountain pass, "Goodbye Death Valley." FYI, if you're looking for the right hook to get your kids interested in this place, that one works pretty well. I know four kids in a mini-van who were totally drawn in. There are a few places to stay in this park, and you will definitely want to plan on staying over; the valley is enormous, and there is plenty to see. Also, it feels good to have a place to retreat to when the mercury rises. The motel at Stovepipe Wells has the lowest prices, and the Furnace Creek Resort has the highest; but for families, the best hotel option by far is the Furnace Creek Ranch. The one-time ranch and borax works occupies a natural oasis right smack in the middle of the valley, where the desert heat is kept at bay by shady trees full of chirping birds, an ice cream shop, and a swimming pool. Families can book traditional hotels rooms or cabins in the grassy retreat. Even better, though, can be bringing a tent to enjoy camping in the lovely desert evening air. While there are campgrounds dotted throughout the park, we highly recommend keeping a base close to the oasis - either at Furnace Creek campground within the oasis, or across the road at Texas Springs. That keeps you close to the only shop for a hundred miles and the swimming pool that lets campers cool off for $5 per day. There are several points of interest in the park, but be prepared to drive between them. Distances are deceiving in the desert, so you'll definitely want to plan a path at the beginning of the day. 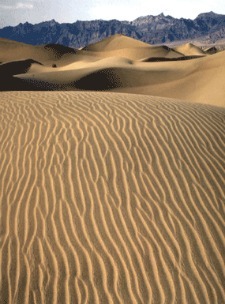 One must-visit is the spot that looks the most like kids imagine the desert to be: the Mesquite Dunes. The beautiful slopes of super-fine sand go for miles in every direction, and the winds wipe them clean every night so they look like they've never been walked on before. A visit early or late in the day makes for gorgeous photo ops, as do the tiny lizard tracks that weave across them. Note that while the sand is cool and delicious early or late in the day, it can be downright painful in the middle. Another absolute must for kids is Salt Creek, home to the most unlikely desert species imaginable: the pupfish. These tenacious critters procreate furiously in the few short months of life they get when the creek actually has water in it. They lay eggs that bake in the earth all summer long until the winter run-off makes it possible for them to hatch and restart the cycle. Their frenzied efforts against extinction make an unmistakable nature lesson, and however you look at it, fish in the desert are a definite conversation starter. The lowest point in the hemisphere is at Badwater, and looking up the mountain to pick out the "sea level" sign gives an awe-inspiring sense of perspective. A walk out onto the borax field at the center is a crowd-pleaser - not to mention a sole-cleaner; wear your dirtiest shoes and watch the bottoms gleam cleaner than ever before. Our kids thought that was a hoot. Speaking of borax, there are some other really bizarre ways of experiencing the old-time laundry detergent ingredient. The Devil's Golf Course (get used to lots of Devil references in the names around here) looks like a scene from another planet, with spiky, bulbous crystal formations as far as the eye can see. Even with four-wheel drive, no covered wagon could drive across this expanse. On the topic of other planets, it's also worth pointing out that a few filmmakers have braved the heat to capture the other-worldly effect of Death Valley's terrain - most notably George Lucas in creating his galaxy far, far away for the original Star Wars. If anyone complains about the heat, just ask how they'd like to be wearing storm trooper uniforms. One of the most surprisingly beautiful corners of the valley is a windy little canyon road known as the Artist's Drive - which climaxes at a pull-off suitable for long, clambering walks known as the Artist's Palette. The hills here are covered in a rich variety of minerals that create a breathtakingly colorful vista. If you happen to catch the area in spring after a winter with rainfall, the colors are made even more startling by carpets of unlikely wildflowers. Far to the north is an oddity known as Scotty's Castle, where an eccentric fellow named Scotty built a really odd home for himself and his wife. Also in the north, accessible only by SUV, is a spot called the Racetrack which has puzzled geologists for years; boulders engage in a slow motion "race" across an ancient lakebed, propelled by a force which is anyone's best guess. Other activities worth checking out include trail rides and carriage rides offered by Furnace Creek Stables at the oasis, ranger talks and programs, and self-led hikes through lovely spots like Mosaic Canyon and Golden Canyon (but avoid the noon sun!). The most important thing to remember in this climate is not to try to cram in too much activity; put Horse with No Name on the car stereo and take it slow. And finally, a word about the climate - which doubtless scares some people away. 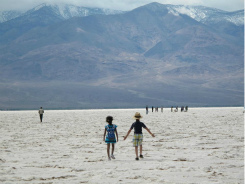 There's no question that the most comfortable times of year to visit Death Valley are late autumn and early spring, but if you're game for experiencing real desert at its deserty best, Death Valley is available to experience at its hottest in the triple-digit summertime, and the pool at Furnace Creek can cool you as often as you like. Always carry plenty of water, slather sunscreen profusely, and stay out of the midday sun. In return you will experience sunrises and sunsets to remember for a lifetime, and moonlit nights with no sounds but the occasional coyote song. Hello Death Valley!